Thermobarometry is the quantitative determination of the temperature and pressure at which a metamorphic or igneous rock reached chemical equilibrium. The term "classical" thermobarometry refers to methods for calculating the P-T conditions of a specific chemical reaction. Why do we need to know pressures and temperatures of petrologic events? Figure 1. 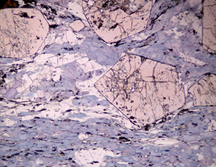 Photomicrograph of a blueschist from Sivrihisar, Turkey, containing glaucophane (blue), garnet (pink), and lawsonite (white). Field of view = 4 mm. If you know the pressure (P) and temperature (T) at which an igneous or metamorphic rock equilibrated, you can determine a lot about where in the Earth the rock formed and how the rock formed. For example, some tectonic processes are associated with characteristic pressures and temperatures: e.g., low temperatures at high pressure occur only in subduction zones. How do we determine (paleo) pressures and temperatures? Mineral assemblages and textures may provide information about the conditions at which a rock equilibrated. In metamorphic rocks, we use qualitative terms such as low-grade, medium-grade, and high-grade (and even 'medium-low' or 'very high grade') to describe the approximate temperature conditions of metamorphism. These designations do not provide information about pressure, and are therefore not useful for describing subduction zone rocks. (1) index minerals : characteristic minerals that provide an indication of the temperature (and, in some cases, pressure) conditions at which a rock formed (e.g., kyanite in metamorphosed shale; magmatic epidote in plutons and volcanic rocks). Not all rocks have a suitable bulk composition to produce index minerals. (2) metamorphic facies : assemblages of minerals, each characteristic for a particular bulk composition and indicating the range of pressure-temperature conditions at which the rock equilibrated (Figure 2). For example, high-pressure - low-temperature conditions characterize the blueschist facies. Figure 2. 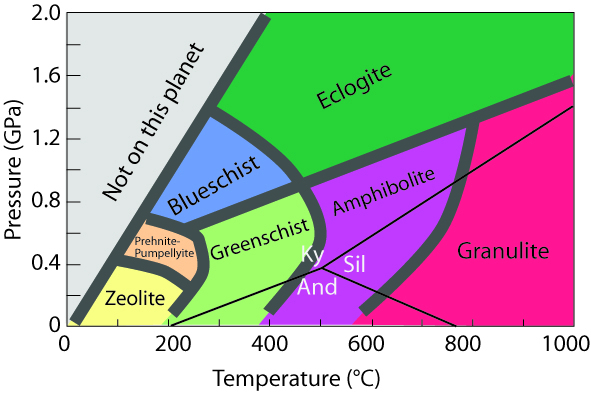 Pressure-temperature diagram showing the locations of the metamorphic facies. Modified from Spear (1993). The Al2SiO5 phase diagram is also shown for reference. And = andalusite; Ky = kyanite; Sil = sillimanite. Some igneous assemblages are also characteristic of crystallization within particular ranges of temperature/pressure conditions. Are qualitative methods for determining P-T conditions 'good enough'? Qualitative methods don't necessarily provide information about both pressure and temperature. In addition, qualitative techniques in some cases give only a minimum pressure or temperature: e.g., the presence of a high-T index mineral may not tell you whether the rock formed at 700°C or 1000°C, and the occurrence of eclogite facies minerals may not tell you whether the rock formed at a depth of 40 km or 75 km. This degree of uncertainty makes the interpretation of metamorphic and tectonic processes difficult. Conceptual basis: The compositions of coexisting minerals in equilibrium are related by the thermodynamic properties of the minerals to the pressure and temperature conditions of equilibration. Thermometers are assemblages that form by reactions that are sensitive to temperature but not (much) to pressure. Barometers are assemblages that are sensitive to pressure but not (much) to temperatures. Not all rocks contain assemblages that make suitable thermometers or barometers. 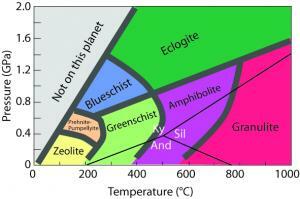 The compositions of all minerals that can have variable composition (e.g., solid solutions). Thermodynamic data for the phases of interest. A 'calibration' that allows you to relate mineral composition to pressure or temperature. Exchange reactions. Exchange reactions involve the exchange of cations with similar sizes and charges between two minerals. These reactions are typically very temperature-sensitive, but are not pressure-sensitive because no major change in volume is involved in the exchange. 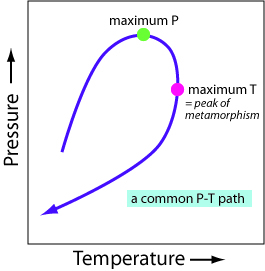 Temperature-sensitive reactions have steep slopes on P-T diagrams (Figure 3a). The most common exchange thermometers involve exchange of Fe2+ and Mg between two minerals, e.g., between garnet and biotite. Solvus thermometry involves phases that form a solid solution at high-T but that 'unmix' into separate phases during cooling. The composition of coexisting minerals that have a solvus relationship is an indicator of temperature (Figure 3b), although in some cases this may be a temperature representing part of the cooling path of a rock. Examples: muscovite-paragonite; calcite-dolomite; orthopyroxene-clinopyroxene; feldspars. Figure 3. Schematic P-T (a) and T-X (solvus) (b) diagrams illustrating general characteristics of thermometers and barometers. Thermometers have steep slopes and barometers have shallow slopes on a P-T diagram. Other : The composition of coexisting plagioclase and calcic amphibole (e.g., hornblende) can be used to estimate temperature. Other thermometers involve trace element concentrations of phases. For example, the concentrations of Ti in quartz and zircon in equilibrium with rutile (TiO2), and the concentration of Zr in rutile are very sensitive to temperature. These thermometers can be applied to igneous and metamorphic rocks, but require an ion microprobe for analysis of trace concentrations (ppm) of Ti and Zr. Another trace element thermometer with applications to metamorphic rocks involves the yttrium concentration of coexisting monazite and garnet (or monazite and xenotime). The concentration of stable isotopes of oxygen and carbon in coexisting minerals can also be used to determine the temperature at which the system became closed to exchange of these isotopes. For example, the O18/O16 ratio in coexisting quartz and magnetite is a thermometer, as is the C13/C12 ratio in coexisting quartz and calcite or calcite and graphite. Pressure-sensitive reactions (barometers) involve a significant volume change, such as the transformation of anorthite (Ca-plagioclase) to grossular (Ca-garnet) + kyanite + quartz. Many barometers are net transfer reactions, and have shallow slopes on P-T diagrams (Figure 3a). Other barometers involve the concentration of an element in a certain mineral in equilibrium with a particular assemblage (e.g., Al in hornblende, Si in phengite). Uncertainties in thermobarometric calculations can be determined by propagating errors from all stages of the P-T determinations: the mineral composition analyses, the thermodynamic data, and the calibration method. Typical uncertainties are ± 50°C, ± 1 kbar. The assumption that the minerals record equilibrium conditions may not be valid. The choice of mineral compositions to use in thermobarometric calculations is easy if all phases are homogeneous, but if minerals are zoned, the selection of compositions to use can be more uncertain. The stability of minerals may be affected by the presence of elements that are difficult to analyze with standard techniques. For example, electron microprobe analyses do not distinguish between Fe2+ and Fe3+, but the difference is important. A thermobarometric calculation may be substantially in error if all Fe is assumed to be Fe2+ for minerals that contain substantial Fe3+. Thermobarometric calculations rely on thermodynamic data and a 'calibration' that allows mineral composition to be related to temperature or pressure. The mineral compositions and crystal structures in the rock being analyzed should not be too different from the compositions and structures on which the calibrations are based. Temperature calculations require an estimation of pressure, and pressure calculations require an estimation of pressure. You therefore either need to know one variable, or use a thermometer or barometer that is very insensitive to the other variable. Hence, the best thermometers have nearly vertical slopes on a P-T diagram and the best barometers have nearly horizontal slopes. What do calculated P-T conditions mean? For igneous rocks, calculated pressures and temperatures likely represent the conditions at crystallization, particularly for rapidly cooled rocks. 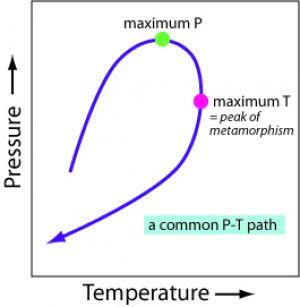 Metamorphic rocks have more complex thermal and pressure histories, but the most typical interpretation of thermobarometric results is that the calculated P and T represent the conditions at the thermal maximum (peak of metamorphism) (Figure 4). It is important to recognize that the thermal maximum may not represent the pressure maximum (Figure 4). Furthermore, it is important to examine the textures of a metamorphic rock and determine if the mineral assemblages/textures are consistent with the interpretation that peak metamorphic conditions are preserved and have not been overprinted during later events. Figure 4. A common pressure-temperature path for regional metamorphism. The first stages of metamorphism involve burial and heating. Following the attainment of maximum pressure (depth), rocks -- which are poor conductors of heat and therefore are slow to heat relative to tectonic rates of burial -- may reach their maximum temperature conditions during the initial stages of decompression. Therefore, the peak of metamorphism (thermal maximum) may not coincide with the depth maximum. Thermodynamic Calculation of Mineral Reactions II Lab (Microsoft Word 48kB Mar29 07) - This Excel-based one week exercise, provided by Dave Pattison at the University of Calgary, includes problems sets involving equilibrium constants, activities and calculation of thermodynamic equilibria involving impure phases, and 'conventional' thermobarometry using the GTB program. Multi-equilibrium Thermobarometry Lab (Microsoft Word 53kB Mar29 07) - This Excel-based one week exercise, provided by Dave Pattison at the University of Calgary, includes problems sets involving multi-equilibrium thermobarometry using TWQ and ThermoCalc's 'AvePT' module ('Optimal thermobarometry').